CAN I SAY Y-I-P-E-E!!! It looks way cute! i will be doing that in approximately 20 minutes! 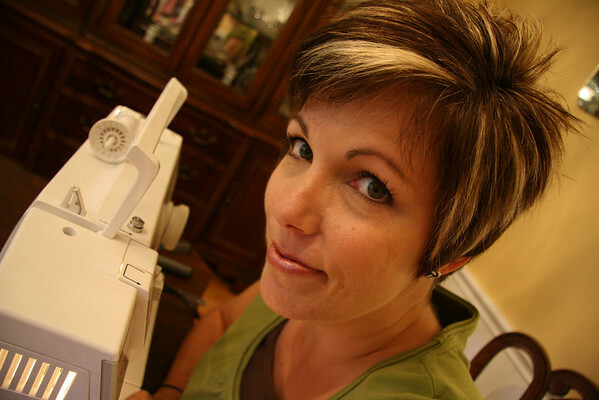 That's a very cute picture of you at the sewing machine. What a great talent! I just sent 6 pants to be hemmed for my son, ugh! The colors on that apron are so cute and bright and fun. Just looking at it makes me happy! Oh, I hope you post the finished project! Looks adorable. Really, really cute. Even makes me want to sew! I got your book yesterday. Thanks so much. I'm excited. Whatever you're making, it's really really cute! And very cute picture of you, too. I'll be waiting for the big reveal of what you were making! I know what it is!!!! And let me say - OH MY GOODNESS!!!!!!!!!!! Yes, you rock, but I tell you that all the time anyway! :) CANNOT wait to get mine going too! I so want to know what you're making. Love, love the fabric! Woohoo! Can you come over and teach me?!?!? I've seen enough to be dying already! Is it an apron? I'm making ruffle aprons like that for teacher gifts this Christmas! DARLING! 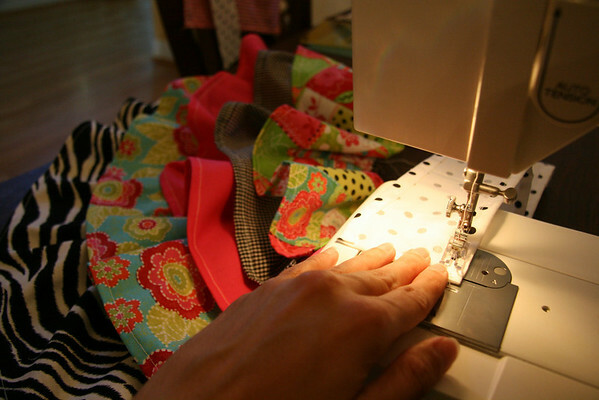 You are such a talent girl...I am very afraid of sewing machines...I need to get over it and start learning how to create! sorry i'm speaking in an accent just in case you didnt know.. I find myself quite funny at the moment..
really you are such a talent. I'm so dying to see what this is- cute fabric! you. are. so. FREAKING. skinny! Oohh! What are you creating? Looks chic and cute!